The key to peace is education. There is a beautiful story behind this picture. One of hope and unity. The Manute Bol Primary School was founded by a man named Victor. When the school opened, one of the first things he did was rally the local community together to raise funds to purchase a chalkboard for the teachers to use. 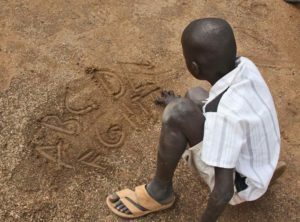 The students used to draw in the dirt, like this child, to practice their writing. Today, they have chalkboards, 6 permanent classrooms, latrines, clean water, storage space, a kitchen, a basketball court, and a recreation area! All because of hope and generosity of donors from the local and global community. Schools like this are possible when we believe and work together to build a better future for South Sudan. Let’s continue to hope and give generously to keep schools like Manute Bol Primary School thriving and growing! Although the country is still experiencing conflict and strife, Manute Bol Primary School stands to bring peace and peacemakers in South Sudan.